To become a legend like he saw one fateful day. Aono swims alone on a remote island, with no teammates, no coach and no rival. But he will have a destined meeting that will change his life forever. Swim through the center of youth! 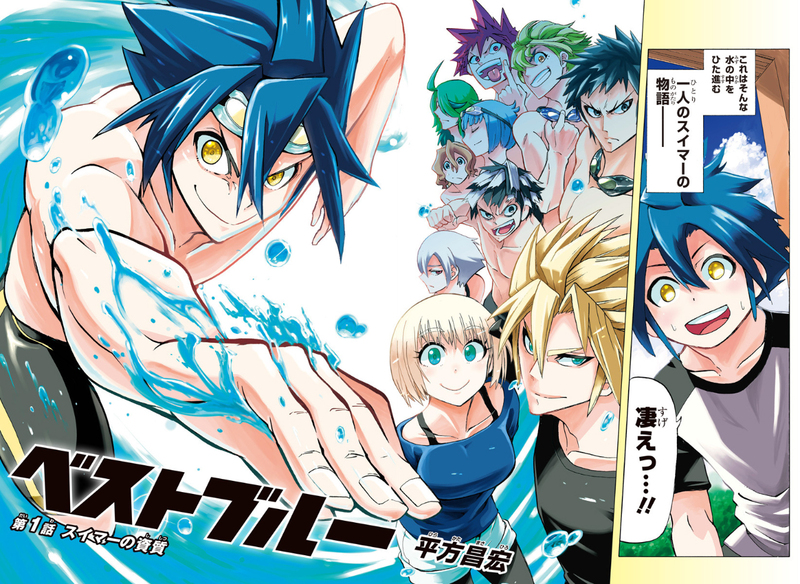 A blue summer comes to Jump! Best Blue began in Weekly Shonen Jump issue 33 by Masahiro Hirakata. Hirakata previously published his Shinmai Fukei Kiruko-san (Rookie Policewoman Kiruko-san) manga series in Weekly Shonen Jump in 2012 but it was cancelled the following year. Best Blue may appeal to many sports readers. From the first chapter we see a protagonist who has a clear goal but no defined route to attain it. The first chapter also reveals a potential rival and teammate for Aono. Overall, the story moves at a good pace but depending on the readers it seems that Hirakata will have to pull all the stocks to keep his new series running.